Trips are open to youth entering grade 6 through 12. Trips are supervised by trained, adult staff. Youth must be self-sufficient, function independently in a group setting of 10:1, and be able to follow all safety rules. Payment-in-full is due at time of registration. Special waivers are required for Zip Line, Horseback Riding, I Fly, Go Carts @RPM, Self Defense, Skyzone, and must be completed by specified deadline or your trip may be cancelled. 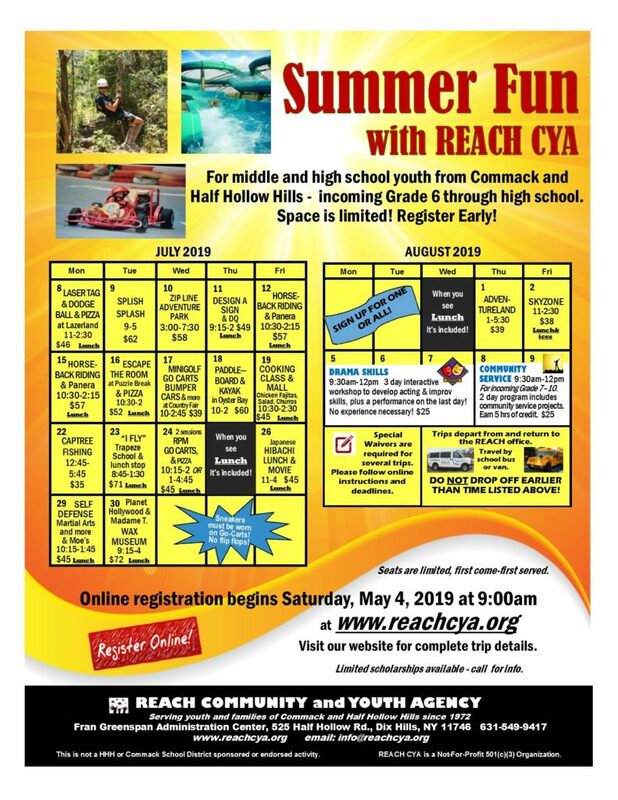 Trips leave from the REACH CYA office at the Fran Greenspan Administration Center/Manasquan, 525 Half Hollow Road, Dix Hills. Travel is by school bus or van depending on the size of the trip. Trip size is determined by the activity and varies from 10 to 40 students. Drop-off and Pick-up times are listed on the calendar. All trips leave 15-30 min. after the drop-off time. Return times are close approximations. Do not arrive early—do not pick up late! All trips are subject to minor changes. Unfilled trips are subject to cancellation and will be refunded. Refunds will not be given unless our office receives notice of cancellation 7 days prior to trip and your spot can be filled. There is a $15 service fee for all cancellations. Cancellations for significant illness or physical injury will require verification by a physician and will be refunded 50% of trip cost if spot is not filled. Lunch is included on: Laser Tag, Design A Sign, Horseback Riding, Escape the Room, Cooking Class, I Fly, Go Carts @ RPM Raceway, Hibachi & Movie, Self Defense, Madame Tussaud’s, Skyzone. If the calendar indicates ice cream or ices, they are included. Please bring a bag meal for: Zip Line, Paddleboard & Kayak, Captree Fishing, all other trips have snack bars available. Extra $ is required. Youth should always bring water and items listed in the trip details. Scholarships are available for specific trips and are based on Free/Reduced Lunch eligibility. Please call the REACH CYA office for details. REACH CYA is not responsible for lost/missing items. LUNCH IS INCLUDED. Youth will participate in 2 hours of unlimited laser tag and dodge ball. Includes pizza lunch and drinks. Wear sneakers! This trip is limited to 40 participants. JULY 9, 2019 – SPLISH SPLASH $62. Full day at Splish Splash. Bring towel, bathing suit, sunscreen, $ for food and lockers. No outside food is permitted in park. Cut-off jeans or bathing suits with metal are not allowed. Valuables should never be left unattended! Lockers are available for $14 per day and can accommodate 2-3 people. Youth may use the park independently and are not required to stay with staff, however they must check in with staff at specified times and location. A staff member will always be available at the specified location throughout the day. RAIN OR SHINE. This trip is limited to 40 participants. Safety and harness instruction followed by zip lining and aerial adventures through the trees. Bring bagged meal, beverages, bug spray. Gloves are provided. Sneakers only. Long hair must be tied back. No jewelry. RAIN OR SHINE! *SPECIAL ONLINE WAIVER FORM REQUIRED* This trip is limited to 35 participants. LUNCH IS INCLUDED. Create a custom made sign on 13.5” x 18” wood pallets. Guided instructions are provided by a professional designer/painter. Participants will choose from a variety of designs. Design selection instructions will be emailed to you as the date gets closer. Snacks and soft drinks will be provided during the activity. Includes $8 stipend for fast food lunch at Dairy Queen after the activity. This trip is limited to 20 participants. JULY 12, 2019 – HORSEBACK RIDING & PANERA $57. LUNCH IS INCLUDED. 1 hour trail ride at Parkview Riding Stable, Central Islip, followed by lunch at Panera. Must wear long pants and sneakers to participate in this activity. A limited number of helmets are available at the horse stable. For a better fit it is suggested that you bring your own bicycle helmet. Includes $13.50 stipend for lunch at Panera. *SPECIAL WAIVER FORM REQUIRED* This trip is limited to 15 participants. JULY 15, 2019 – HORSEBACK RIDING & PANERA $57. JULY 16, 2019 – ESCAPE THE ROOM & PIZZA @ PUZZLE BREAK, SYOSSET $52. LUNCH IS INCLUDED. *NEW LOCATION FOR 2019* Small groups will be locked in 4 fully themed rooms. A staff member will accompany each group. Participants are given 60 heart pounding minutes to solve the puzzles, find the clues, and escape the room. Includes pizza lunch, beverage and ice cream. This trip is limited to 35 participants. JULY 17, 2019 – MINI GOLF AND GO CARTS @ COUNTRY FAIR. $39. Unlimited use of go carts, mini golf, driving range, spin bumper cars and batting cage at Country Fair Entertainment Park. You must be 55″ to ride the go carts. NO FLIP FLOPS!! Bring $ for lunch, snacks, drinks or game tokens. This trip is limited to 40 participants. JULY 18, 2019 – PADDLEBOARD AND KAYAKING $60. Have fun with both paddleboards (SUPs) and kayaks as you explore Oyster Bay Harbor. Includes trained instructors from the Waterfront Center. Life jackets are provided. Bring a bag lunch, drink, towel, sunscreen, and eyeglass strap if necessary. This trip is limited to 20 participants. JULY 19, 2019 – COOKING CLASS & MALL $45. LUNCH INCLUDED. Youth will be experience a hands on cooking class at “What’s Cooking” in Oyster Bay. They will learn how to prepare an authentic Mexican meal from scratch. Menu consists of chicken fajitas, Mexican corn salad and churros for dessert. Participants will then enjoy their creations for lunch. We will stop at Walt Whitman Mall for shopping following class. This trip is limited to 16 participants. 3 hours of fishing on the Captain Whittaker out of Captree State Park. Poles and Bait are provided. Bring bag lunch, drinks, sunscreen, $ for snacks. RAIN OR SHINE! This trip is limited to 20 participants. JULY 23, 2019 – I FLY TRAPEZE SCHOOL & LUNCH $71. LUNCH INCLUDED. Located in Eisenhower Park. Includes 2 hours of instruction and “FLY” time. Instructors are qualified to teach all ages and levels. Includes $8 stipend for fast food lunch at Wendy’s after activity. **SPECIAL WAIVER FORM REQUIRED** This trip is limited to 15 participants. JULY 24, 2019 – GO CARTS & PIZZA @RPM RACEWAY RACEWAY $52. LUNCH IS INCLUDED. Electric, high performance indoor go carts. Includes 2 races (15 laps each) plus a $5 arcade game card (no prize redemption), 2 slices of pizza and soft drinks. Minimum Height Requirements: Youth carts 48”, Adult carts 58″. Sneakers are required!! ABSOLUTELY NO FLIP FLOPS! *SPECIAL WAIVER FORM REQUIRED* This trip is limited to 20 participants. Hibachi lunch at Gasho of Japan. Menu: soup, vegetables, white or hibachi rice, chicken and steak combo, soda and ice cream. No substitutions or special orders except for vegetables only. Includes movie: theater and movie will be determined after theater schedules are posted. This trip is limited to 40 participants. LUNCH IS INCLUDED. Students will learn valuable self-defense techniques while participating in a series of martial arts activities. Activities will also include karate instruction, kicking bags, obstacle course and other challenges. Includes $13.50 stipend for lunch at Moe’s. SPECIAL WAIVER FORM IS REQUIRED* This trip is limited to 20 participants. Drop off: 9:15am, Pick up: 4:00pm. LUNCH IS INCLUDED. Enjoy lunch at Planet Hollywood in NYC. Movie Star Classic Menu: Choice of Classic Hamburger or Cheeseburger with fries, Chicken Caesar Salad, Six Cheese Chicken Macaroni, Chicken Tenders with fries, brownie and beverages. Followed by a self-guided tour of Madame Tussaud’s Wax Museum which includes “The Marvel” exhibit with 3D and 4D Movie & Theater experience. This trip is limited to 35 participants. Trip includes unlimited ride bracelet. Games and arcade are not included. Bring extra $ for snack bar and games. NO FLIP FLOPS!! Must wear sneakers. This trip is limited to 40 participants. LUNCH IS INCLUDED. Indoor Trampoline Park. 1 hour of jump time and Dodgeball. Includes use f Sky Slam basketball courts, warp wall and ball pits. Pizza lunch and unlimited drinks included. Includes: Sky Socks which are required to jump. Includes $3.50 stipend for Italian Ice at Rita’s. *SPECIAL ONLINE WAIVER FORM REQUIRED* This trip is limited to 20 participants. 3 Day interactive workshop for theatrically inclined middle and high school youth. Develop acting and improv skills and end with a performance! No experience necessary! Taught by a theater professional. Snacks and drinks are provided. This program is limited to 16 participants. Returning students are welcome! For students entering grade 7-10. This two day program consists of fun activities and daily service projects that will help youth experience the awesome feelings of empathy, responsibility and citizenship. Students will also earn 5 hours of community service credit. Snacks and drinks are provided. RETURNING STUDENTS ARE WELCOME! This program is limited to 16 participants.